Virginia in the fall brings to mind trees lined with multi-colored leaves, quaint pathways for long walks, old towns kept intact and pleasantly populated to volumes that bustle but are small enough not to feel like a congested cityscape. This is only one perspective though and local state bands like Feral Conservatives have shown that this rural-minded state might make a pretty postcard but can also most definitely rock out with the best of them. Well, lo and behold, another up and coming band is about to add to Virginia’s rock factor. Meet Skyward, the five piece alternative rock band from Charlottesville that’s out to carve a new space between the lines of alternative, pop, and electronic stylization with the arrival of their eponymous full length album, out tomorrow, 30 September 2016. Actively pursuing the full-time band life since February 2012, Skyward might only be releasing its full length now but the quintet hasn’t been without plenty to keep busy and many milestones to mark the band’s outwardly noted progress. Live performance (400 shows over four years that has taken the band up and down the U.S. east coast) has made enough of an impression for the band to play Warped Tour with the likes of Pierce the Veil, The Plain White T’s, as well as having music picked up for sync placement in “Keeping Up With The Kardashians,” “Stewarts And Hamiltons,” and “Roadtrip Nation.” After so much build up and active work, the arrival of a full length couldn’t come at a more well-timed moment in the band’s development. This eponymous release follows an EP titled Drift (independent, 2014) and no matter how it’s initially approached – musically, visually, or from a business-oriented point of view – the self-titled record exudes a level of cohesion that makes Skyward’s independent, unsigned status that much more applaudable. 11 tracks (12 if purchased with the bonus track from Bandcamp) kick off with an immediate sense of the dramatic and theatric, not far from the realm of the melodically driven rock manifestos and anthems crafted by bands like Crown the Empire – especially circa 2014’s The Resistance: Rise of the Runaways. (A little slip / a little casual rage / a red covered with black in case / This is my / This is my daily) The band’s preferred sonic style incorporates an ample amount of reverb, delay, and a see-saw like balancing act between clean toned guitar in the leads and more jagged and-or heavy tones for driving rhythm lines. All of these elements are presented within the first track, which pours seamlessly right into the second, adding to the attempt to create a continuous atmosphere of a listening experience – intended to be a singular, unbroken road. Anna Breeding and Huang trade-off solo vocal lines with synchronized harmonies or unison choruses that often go for a dynamically powerfully delivery over a delicately sung ballad style vocal and more so than the duo’s tonal synchronicity, their ability to keep together dynamically – never one out shining or over belting the other – but not drowning in an overt artificial fencing, is pleasing to hear. It’s easy for this almost pop-punk style choral belting to either feel imbalanced or overworked in production – neither of which is the case here, even with the presence of plenty of electronic components via prominent synthesizer lines (“Animal,” “Stand-Ins,” “Drag Me Through”). There are clear signs of wide casting, pop-minded songwriting with this album; structures that offer easily absorbed melodic hooks and lyrical repetition (I’m not, I’m not, I’m not / That lover, I’m nobody’s way home / I am, I am, I am / That fighter / And I’ll take this on alone / On alone). The race to establish familiarity is, at other times, off-set by surges of power chords and-or non-conventional effects (“Now”), showing where Skyward is working to keep rock and pop as the neighbors on either side of the place where this record wants to live. Huang’s vocal pairs with the frequently minor key-oriented melodies of the record, resulting in an aesthetic that shows Skyward could be at home on a show bill with 10 Years, (“The Floor,” “Crows and Wolves”) while Anna Breeding’s smooth, sometimes wisp filled singing style leans toward either a Lacey Sturm/Flyleaf vein (“Burn”) or the more melodically somber benchmarks in Hayley Williams’ career (“(m)arrow”) – each relatable and complementary but neither ever creating a direct overlay. What do make nice overlaying touches, are the various pannings set for many of the tracks, fluidly moving and emphasizing individual parts of songs back and forth between one’s ears and providing another dimension of texture without further cramming the mix with more sound. Almost as if to foresee possible listener trepidation around too much duality in the band’s sound, “Giving Tree” cuts through like an unexpected palate cleanser. Dynamically quieter, rhythmically calmer, and instrumentally tempered (strings and straight piano added in, sans synth effects), this track’s main message rings out in repetition like many of the other songs (I gave you my all but it was not mine to give). However, without a thunderous roll of backing parts parading behind them, Breeding and Huang’s harmonized parts are able to really mesh and settle in with one another, showing how naturally appealing these two voices are when intertwined – a conclusion that simply doesn’t ring true for all pairs or trios of vocalists, even if singers hit all the right notes. In addition to the change in compositional style, “Giving Tree” surprises also in the fact that this track – which gradually grows in stature and peaks with a backing chorus singing the refrain and creating an almost gospel-like character – is not the finale of the album. Its degree in variance is so stark but enjoyable that the track placement itself could serve as the singular major deficit to Skyward‘s experience but, that’s getting hypercritical. Luckily, the actual closer, “Drag Me Through,” upholds enough of the penultimate shift to make any initial dissatisfaction recede, as the band return the music to its base style, almost like a reminder send off so listeners remember what they arrived to, rather than confusing them on the way out. The album concludes back on a note of high energy and with a their initial dramatic rock-fueled pulse but, the song takes listeners to the end by way of a distinctly major key trajectory, which is just enough of a combination of the refreshing and the re-orienting for the hierarchy of the finale to ultimately feel sensible and satisfying. Overall, Skyward’s self-titled is a stable and assertive project for a first, and self-produced full length outing. Where the band are headed as far as their long-term aspirations for carving themselves a new place between rock, pop and electronic intrigue remains to be seen but, for now, there’s no question this quintet is packing all the commitment, persistence, and unity they need to get to the next level. Skyward is looking up and so is this debut. 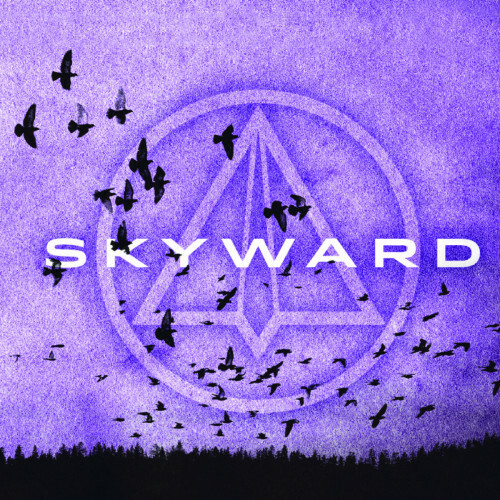 Skyward is available through iTunes, Amazon, and Bandcamp.